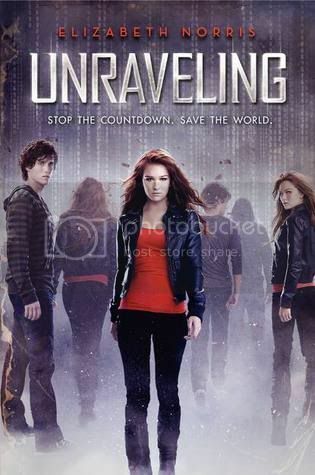 Unraveling is a highly addictive sci-fi novel by debut author Elizabeth Norris. I am so pleased to have had the chance to review this book for my blog! Seeing her life flashing before her eyes after being hit by a pickup truck, seventeen year old Janelle knows that she is dead. Only she isn’t dead at all. She wakes up to find a loner schoolmate, Ben, kneeling over. Did he really bring her back to life? That is the question Janelle keeps asking herself. It’s up to Janelle to find out how, and why, Ben saved her. And she must also find out if Ben has anything at all to do with the clock that is counting down to the end of the world. Janelle proved to be quite an interesting main character. She was a very bright, intelligent young lady. She is much like her father with her keen observation skills, and never seems to miss a thing. When tragedy ensues, Janelle takes matters into her own hands. Ben’s character is one I knew I would like from the beginning. He was so very mysterious, and I enjoyed unraveling the mystery that is Ben. The secondary characters in the story were intriguing as well. I really came to care for quite a few of them; Alex, Janelle’s best friend, also for her dad and brother, Jared. They all were very well written, and made quite an impact throughout the book. I found the book to be very well paced; I finished most of it in just a day’s time. The plot held my attention, and I have to say it was a great breath of fresh air compared to some of the books I’ve read lately. There is a bit of romance in the book, but I didn’t overpower the book as I expected it to. There were more than a few moments in the book where I was screaming: “Oh my gosh, I know that didn’t just happen!” The author definitely didn’t hold back. I am also pleased to say that this book kept me guessing right up to the end. Overall: I’m not much of a sci-fi fan. However, I enjoyed reading Unraveling a lot more than I expected to. The unique characters and the addictive storyline all flow together to make a wonderful read. Super excited to read this one I had to put it off and I'm dying!!! I love the contdown idea and the fact that it's a bit sci fi! Awesome review!! Christie! I have been reading the most fantastic reviews about this book and yours joins the pile! :D I'm extremely excited to get my hands on the book and have my fingers tightly crossed that my review copy comes next week :) I've never been a huge sci-fi fan either but it seems as if it's tackled very well in Unraveling! Oh I'm so excited to meet the characters and see all of the twists play out!! YAY!!! I loved this one so much too, it was just fantastic:) I knew I would like Ben from the beginning as well, and I love that Elizabeth didn't pull any punches when it came to her characters. They were flawed and interesting, and she didn't fade to black when bad things happened. LOVE! I'm excited to read this one. Knowing that you liked it even though you're not a sci-fi person makes me want to read it more! Great review! And I am a sci-fi fan, so I can't wait to get my hands on it! I quite like sci-fi, so I've definitely been intrigued by this! The characters all sounds great too, I'm excited to meet them. Glad you enjoyed this one, thanks for the review :). This looks so good, great review! Growl! I totally saw this on Amazon Vine and didn't get it right away then, when I went back, it was gone! Oh, well. Off to the library I go. I love that it surprised you and you liked it more than you expected. So awesome when that happens. Great review Christy! I'm really hoping Amazon ships my copy out soon!! Can't wait to read it! It's always great when you like a book more than you expected to. This one sounds great! Yay more good reviews! I am definitley getting this book soon!